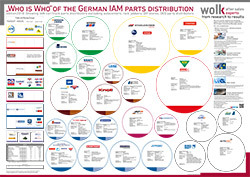 Looking at the automotive aftermarket there is a wide range of different component manufacturers. 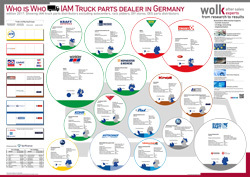 Some of them are suppliers of car manufacturers and some of them are only serving the independent aftermarket. There is a certain amount of inter exchange of components among the parts manufacturers. Especially in the field of inspection and maintenance parts are many companies that not only produce car parts for themselves but manufacture these spare parts for other parts manufacturers, assortment optimizers, and distributors/wholesalers. The range of products in the respective product categories is very different. While some component manufacturers produce more than 90% of the offered spare parts by their own, there are other companies that produce only 20% of their parts and purchase 80% of other manufacturers. In addition to these component manufacturers, there are so-called contract manufacturers and assortment optimizers. 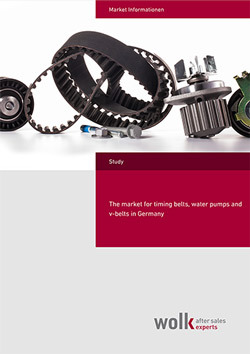 These companies do not have their own production but have specialized in marketing their own product lines for car parts that other manufacturers produce for them. 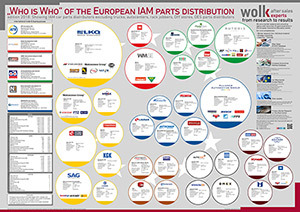 They buy the necessary spare parts on the European market or worldwide and re-pack them. Thirdly, there are the own brands of parts wholesalers, trade and buying groups and car trading groups. These companies use their purchasing volume and sales network to sell fast mover under their own brand. It has to be noted that these own brands have grown considerably in recent years. The manufacturers of components see this trend with mixed feelings: On their own, new sales channels are created for their products, on the other hand, a cannibalization effect with their own brand can occur. 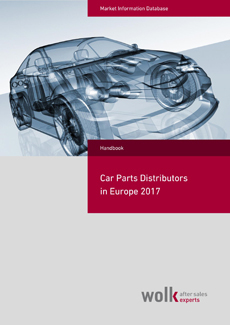 This report provides you with the information which companies in the European automotive aftermarket are purchasing components from other manufacturers to market and distribute them under their own brand.